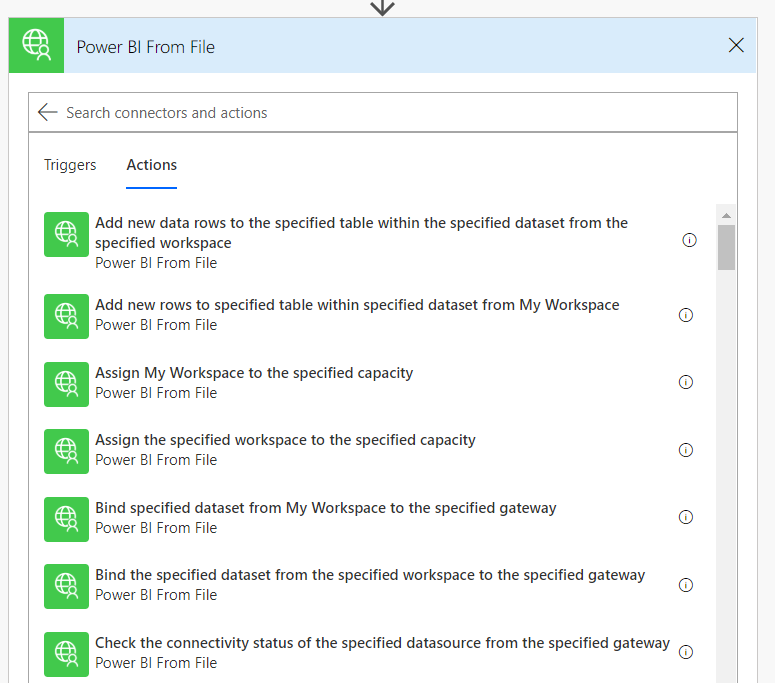 Chris, you mention: “it turns out that there is an OpenAPI definition file for the Power BI REST API available here” which points to https://docs.microsoft.com/en-us/connectors/custom-connectors/define-openapi-definition . While this is an excellent description of the OpenAPI capabilities, they use Text Analytics as an example. I was expecting json file for PowerBI somewhere, but can’t find it at that page. Any idea? This is a great post, thanks a lot! The link now opens a github page where we can switch to “Raw” and copy&paste the json in an new file that i can upload. However, when i upload the swagger file, I get an exclamation mark within a triangle in front of all the actions an references on the “Definitions” pane. Validation errors are “Contains a schema which has properties yet is not marked as type ‘object’.” and “Type not defined”. While I can define the type by setting it to string, I still have the first error. What am I missing here? Don’t worry – these errors don’t stop the connector working. Hi Chris – unable to find the OpenAPI definition file for the Power BI REST API at the link behind “here”… was that a mistake? I fixed the link about 30 mins ago – are you looking at the post in a browser? This looks very helpful – thanks for sharing. Chris, although following the instructions carefully I could not create a custom connector. “Encountered internal server error from Azure Resource Manager. Trying the “Create from blank” option just gives me another tracking Id. I don’t know what to do with that Tracking Id so any help is appreciated.